I got the Duck Lapbook resources up on the site in case anyone wants to use them!! I made all of the templates myself, they are all linked up in PDF form. Pac Man is about half way done with his lapbook and then we will post the final photos. We began our lapbook all about DUCKS today! Pac Man (almost 7 now) loves ducks, especially ducklings, and chose this as his next lapbok. 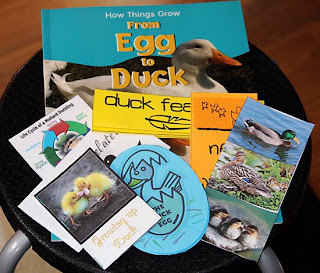 I could not find a complete (free) duck lapbook online so I created one based on this book From Egg to Duck (How Things Grow) for him. We have this book as a part of a entire series we got for around $20, I love snatching up deals like that! **If you’re not a member of LES, you should be, that’s where I got these, and many other GREAT deals). This will be the first lapbook he is more responsible for independently. I have introduced all of the minit books to him, and all of the answers are found in the book, I even slid each minit book in the pages where it has the answers. 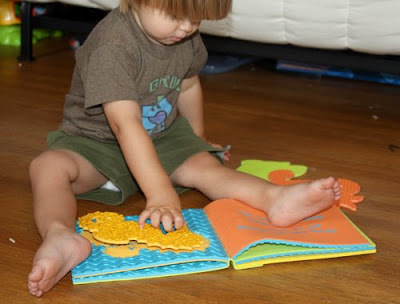 He will complete this one on his own, learning independently. He was really excited about this! I will share the files and final product when we are done! 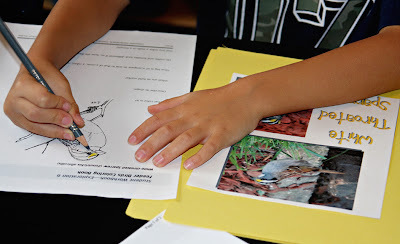 We began our Backyard Birds lap/notebook and we’re loving it! I let Pac-Man choose the birds we will study, with only 1 stipulation-he has to have seen one in either our backyard or the backyard of his grandparent’s down in NC (he bird watches a ton down there). For his first bird, he chose the White Throated Sparrow, which I think is a really cute bird! In the photo below you can see the cover of this section, which has the name and 2 photos I took of this bird in our backyard. He is coloring the bird from this online coloring book of birds. We got the WONDERFUL mini books from Homeschool Share’s great Backyard Birds Lap ~n~ Note. There are tons of resources to use. 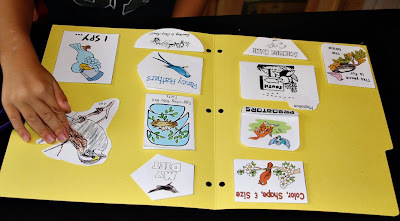 Be sure to check out Ami’s (the creator of these wonderful minis) post about her son’s backyard birds Lap/Notebook, it’s awesome! We are putting each of his folders like this one together into a 3 ring binder (you can see the wholes punched in this folder). I am learning more than I ever even wanted to know about birds!!! P was excited to work on these with me today… I printed them on card stock from here. Together we laminated them (using our wonderful Scotch Thermal Laminator which we got from Costco a few months ago). I wrote the names in pencil on the back so he could familiarize himself with the many different types of dolphins there are. I got K involved today as we played together with one of his favorite books, Textured Soft Shapes: High Tide which happens to be about the ocean! He loves this book and can name the 4 animals in it: sea horse, crab, fish, and starfish! Below P is coloring ocean animals in Spanish. 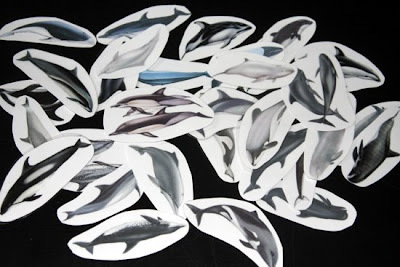 He also completed the labeling for his dolphin anatomy sheet. He is smiling and looking like he is loving it, but don’t be fooled, he wasn’t all that thrilled with ocean learning projects today! All he REALLY wanted to do was the laminating! We are beginning our summer lapbooking project, which P is enjoying since he chose the theme! This summer he chose the ocean, with a specific focus on dolphins, whales, and sharks. We are going to Sea World in September which will be a wonderful finale! 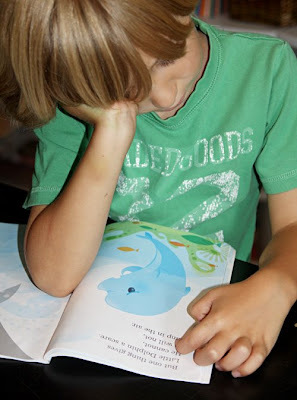 Here he is reading the book, Dolphin’s Big Leap, which we got for about a dollar at a consignment sale…it’s a great book! 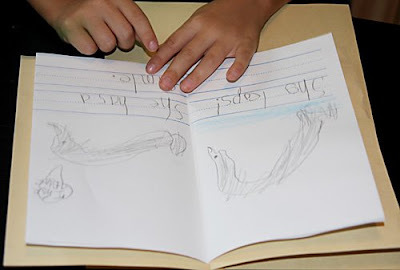 And he wrote his own “easy reader” about a dolphin. He began writing books awhile back, and is still doing this periodically. 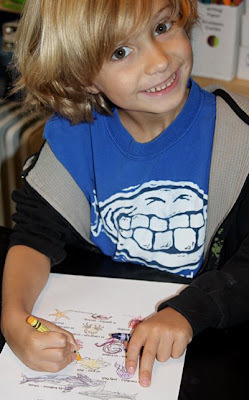 He writes longer stories (usually having one illustration and lots of writing), or easy readers (several illustrations with a simple sentence on each). He came up with this on his own, I let the writing be guided by him. Today he felt like making an easy reader! I am still not entirely sure how I will put the lapbook(s) together. I am trying to be very laid back this summer and not push school type things much. I really want it to be fun and a break for all of us. So far it is going well! I think with this break, we will all be ready to get back to school when it is time (I haven’t exactly decided when that is!). I got our webpage started for this lapbook theme, although there isn’t much up there yet besides our books!